This paper attempts to critically analyze the achievements of INSW system related to the acceleration of international trade activities handling in ports and decreasing logistics costs. This paper started with the analysis of factors triggering the establishment of INSW system and its development from time to time. Furthermore, this paper found that regardless some achievements realized by INSW system, there are several problems remain that need to be adequately addressed. 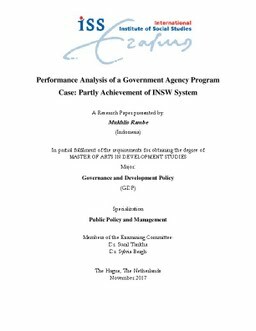 To find out the contributing factor of the partly achievement of INSW system, this paper applied the theory of capacity development accessing five dimensions in where INSW agency works. From the assessment of the five dimensions, this paper concludes that Lack of political will in supporting INSW, poor communication and coordination, not fully integration of ICT, less budget independence, and human resource shortage are the causes of the partly achievement. Moreover, In addition to the strong support and political will of the government, the results of this study also reinforce the argument that active participation and synergy of all actors involved is a prerequisite for programs requiring the involvement of many actors.